WASHINGTON (CNN) -- Judge Sonia Sotomayor's world these days is a tiny, plain office in the Eisenhower Office Building next door to the West Wing of the White House. There she prepares for next week's confirmation hearings to become the 111th person to sit on the U.S. Supreme Court. 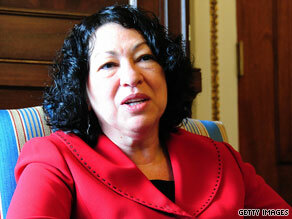 Supreme Court nominee Sonia Sotomayor has met privately and separately with more than 70 senators. While a group of mostly young lawyers meet regularly with her, sources close to the judge say much of her time is spent alone, reading her past cases and speeches, taking notes -- the monotonous, grinding work every high court nominee must go through to endure the intense scrutiny by the Senate Judiciary Committee. Away from her family, friends and colleagues in New York and the comfort zone of her judicial chambers, the federal appeals court judge has felt overwhelmed at times by the media attention and intense preparation, say sources close to her. But they say she remains focused and surprisingly upbeat about the unpredictable public stage she is about to take. "She has always possessed this quiet confidence in herself, which really never crosses into overconfidence," said one longtime friend who asked not to be identified. "Sonia is proud of her record as a judge, proud of her upbringing, and proud of herself. She'll do well" in the hearings. Democrats are confident as well, predicting she will be confirmed. The hearings are expected to last no more than a week, with time for an opening statement from the nominee, and perhaps two days or more of questioning from senators. No vote by the full Senate -- the last step in confirmation -- has been scheduled, but President Obama has said he wants Sotomayor on the high court by the time lawmakers recess in early August. The Bronx-born judge who sits on the U.S. Court of Appeals for the Second Circuit has also met privately and separately with more than 70 senators, informal sessions where topics can range from serious discussions about judicial philosophy to chitchats about family and hobbies. "It always helps to be nice, to have that winning smile. The more you can do these courtesy calls, the better it is. People get to know you before you enter the inner sanctum of the Supreme Court," said Ken Duberstein, who helped shepherd four high court nominees through the confirmation process in the Reagan and Bush 41 administrations. "Remember, if they're confirmed, that's it. That's a lifetime appointment and these senators can do nothing about it." Those who have survived the process say it is not much fun. Several current and past justices have noted the seemingly endless prep work, where every past case, every speech, every aspect of one's professional life needs to be reviewed, since one does not know what senators will ask. Some have privately called it an enormously draining experience, physically and mentally. "So she's got to hit the books," said Thomas Goldstein, a leading Washington appellate attorney and founder of scotusblog.com. "They can ask you about any part of the law. And she's got to be ready for that and be able to sound intelligent answering those questions." Some judges have likened the hearings to inquisitions, but one nominees can use to their advantage. Sotomayor, like those before her, is undergoing intense mock confirmation hearings, private prep sessions where government and private lawyers pepper her with hypothethicals. Aides have studied the records of GOP senators on the committee and have offered possible questions that might be asked. Friendly Democratic senators on the committee work quietly with the administration to devise friendly lines of questioning. White House officials -- past and present -- have been careful to note they do not tell the nominee what to say, but will often advise them about how to frame an answer, or caution about saying too much. "She has to maintain her judicial independence in a very political process," said Goldstein. "So it's a delicate dance and it involves an army of people." Appearance matters too, as well as a good story to tell. Sources involved in the confirmation process say Sotomayor will spend much of her opening statement talking about her biography: of growing up the daughter of Puerto Rican parents, and the sacrifices her mother, in particular made for her children. She will talk about living for a time in a Bronx housing project, about her Ivy League education, her work as a private attorney and a volunteer for a number of legal and charitable causes. When the questioning starts, anything can happen. "Everybody doesn't want to be asked one question," said Duberstein. "What's the one question -- I always advise a nominee this -- don't tell me, but prepare for an answer, because that question inevitably will be asked." But if a nominee is asked about a hot-button issue like abortion or the death penalty, there is always the so-called "Ginsburg Rule" to fall back on. That was the moniker given when Ruth Bader Ginsburg pointedly and repeatedly refused to give specifics answers on sensitive topics during her Senate scrutiny. Lawmakers of both political stripes then -- and now -- did not object too strenuously. A typical Ginsburg answer: "I must avoid giving an advisory opinion on any specific scenario. Because, as clear as it may seem to you, that scenario might come before me," she said. "I must avoid responding to hypotheticals, because they may prove not to be so hypothetical." It has since become an unenforceable tradition, that subsequent judicial nominees have invoked. That has many court watchers convinced the Sotomayor hearings will be a non-event, since Democrats now have a filibuster-proof majority. Even some Republican activists say privately there is nothing now in her known judicial and personal record to doom the nomination. But she will be hit with questions about her views on affirmative action, gun rights, and whether her Latina heritage would unfairly affect her judicial rulings. "The trouble with Supreme Court nominations these days in confirmations, they take on all the attributes of political campaigns," said Duberstein, "from nasty attack ads to the expenditures of obscene amounts of money" by outside partisan groups. "That's unfortunate, but it's real and it's been going on 20 something years." Sotomayor is taking all this in stride, colleagues say, somewhat anxious but undeterred. For solace, the judge talks daily with her mother, whom she calls the most important person in her life. She took time out of her cram sessions June 25 to briefly celebrate her 55th birthday. Members of White House Counsel's Office gave her a framed, signed picture of her with President Obama and Vice President Joseph Biden the day her nomination was announced only a month earlier. A person close to her said she now feels like she has been reliving her entire life since then. In a way, she has.